Quietly behind the scenes of Hope County, Montana, a religious zealot has been amassing power and forming a cult so strong, that even the US Government has little chance of taking it down. Project at Eden’s Gate and its followers, colloquially known as Peggies, have been making life a bit of a hell for the citizens that don’t wish to join its ranks. 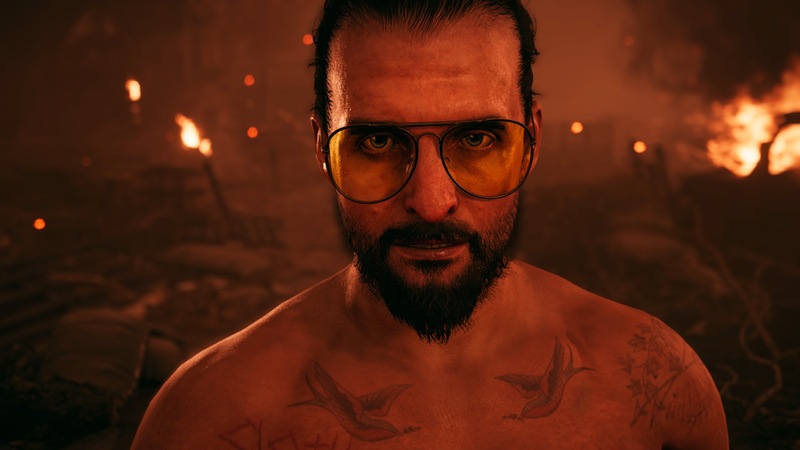 The leader of the cult, Father Joseph Seed, marks one of the Far Cry series’ most believable bad guys, a charismatic leader whose sins he wears proudly upon his flesh. Far Cry 5 marks the series return in a few years and the setting couldn’t possibly be closer to home. The open fields and wooded back-paths of Hope County, Montana are best explored with a partner, and even if you’re not the social type of player to hop online, there’s always someone that’s got your back. As the Deputy, you’re going to need as much help as you can get to stand a chance against the PEG elite. Accompanying the Deputy can be one or two Guns for Hire, a new system that’s been implemented into Far Cry 5, giving the player incredible freedom to deciding whether to balance their fighting style or take some squadmates that complement each other nicely. Want someone that can bring in a chopper at a moment’s notice, or maybe someone that can keep a much lower profile and act as a huntress in the night? What about a pair of belching, hormonal dudes that are as raunchy as they are explosive in combat? That, my friends, can be yours with the power of Yes. And, of course, Boomer is always willing to join the Deputy on their hikes through the mountain passes as the best of boys. 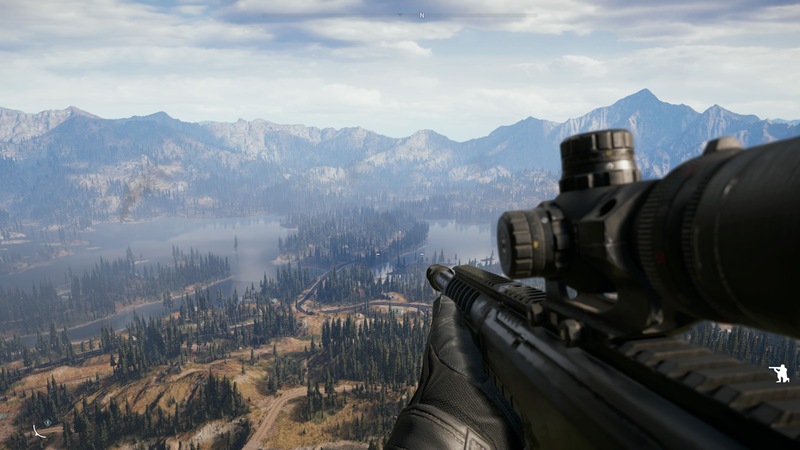 Far Cry’s formulaic design to an open world has been well established for a few games now: climb towers to expand your horizons, hunt and skin animals for crafting materials, and slowly chip away at a region’s influence to weaken the antagonist’s hold on the area. Much of the framework to the design still stays true in Far Cry 5, but it’s clear that the teams at Ubisoft have learned to break free from those established conventions. Save for one tower climbed purely to be self-referential, the player is going to have to put in some footwork to get a feel for Hope County. The occasional map and travel guide can add new points of interest to the map, but there’s no longer a need to climb to the highest point and synchronize to one’s surroundings. Skinning animals has equally been streamlined; while animals can be hunted and skinned, their pelts are merely used to trade in for new cash. Instead, perks are regularly earned by way of the occasional treasure hunt or basic combat challenges. Perks are then spent on permanent upgrades including health and ammo capacity increases that can also carry over into Far Cry Arcade, so it’s certainly worth it to take an extra moment and find a new fishing hole you haven’t tried before. Before the Father, Joseph Seed, can be faced, one must first eliminate his three Heralds, each member of his family that controls a third of Hope County. Each region hides their leader well and it takes a certain amount of resistance to make them come out from hiding. Instead of merely being forced into completing story missions back to back, the player has the freedom to wreak as much havoc as their want to force an encounter. Just about every roaming patrol, every outpost in need of liberation, and every death-defying Clutch Nixon run will contribute to this in record time. Far Cry 5 is a lesson learned in not wasting the player’s time to keep the story going and there’s little need to 100% the open world if all you’re looking for is a climax to one of Ubisoft’s most deranged set of antagonists. Each of the three Heralds harbor their own sins and are perhaps even more psychotic than that of Vaas or Pagan Min, each driven into a certain madness by their blind faith to the Father. 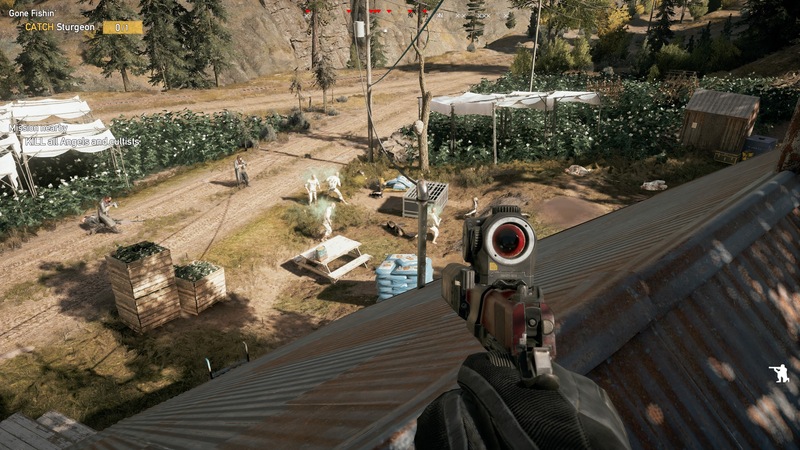 For being an open world, Far Cry 5 is incredibly accommodating to any given playstyle to approaching combat. The gunplay feels properly weighted and weapons each have a nice amount of kick that makes gunfights feel as powerful as they look; even the few times melee combat is necessary has a nice heft to swinging a metal pipe into a peggies’ cranium. As the player’s greatest sin is that of Wrath, there’s never a peaceful solution to making it out of Hope County in one piece. Instead, it comes down to just how loudly the player wishes their presence to be known. Going in guns blazing can often be an effective solution, just as long as you’re willing to handle a few alarms and extra reinforcements when taking back an outpost. The silent approach is often the easiest way to go; between distracting guards away from their posts and delivering a quick one-hit kill from a silenced firearm, this is often the least messy approach to take. Hope County is a site of pure bliss and beauty, with idyllic mountain backdrops and a landscape that hasn’t been touched by modern gentrification. I fell in love with simply picking a direction and heading off without any purpose, letting the rolling hills be my guide as I looked off into the distance for another point of interest. Even as roaming groups of Peggies would patrol the streets seeking my head, there were serene moments of simply taking in the fresh air and engaging in a bit of fly fishing to contrast with the action. For the first time in the Far Cry series, Far Cry 5 adds in co-op gameplay that doesn’t feel like merely an extra mode, but rather something that can add to the core experience. From the Deputy’s first steps off of Dutch’s Island, the entire map of Hope County can be explored with a friend. Without limitations of being gated out of story missions, both players can explore the landscape at their own pace and still feel like they’re making progression. While only the host can get credit for completing a given mission, both players can chip away at the various collectible trophies and perks while creating some memorable stories to tell their drinking buddies back home. It’s too bad that the co-op is limited to friends only on PS4 with no option to invite strangers and perhaps make a new friend. Far Cry 5’s other massive addition to the multiplayer landscape is the addition of Far Cry Arcade. You won’t be able to get very far in Hope County without running across an arcade machine advertising this side content, but it can just as easily be accessed through the main menu whenever you want. One half of the multiplayer content is the usual assortment of deathmatch and competitive modes which seemed standard for most FPS titles and sadly, I was only able to take part in a couple of matches in the days leading up to review (without bots, players are forced to wait for 6 players to join up, something I suspect won’t be an issue whatsoever after launch). The second half to Far Cry ‘s multiplayer offerings is in the suite of user-generated maps and content that make up the majority of Far Cry Arcade. From combat arenas to guided exploration journeys, there’s a rather eclectic mixture of new content that players can dive into with tools simple enough to create something new at a moment’s notice. Players aren’t just limited to the fields of Montana in the toolbox and I found some decayed urban landscapes to explore through that would’ve been right at home in a sequel to The Last of Us. 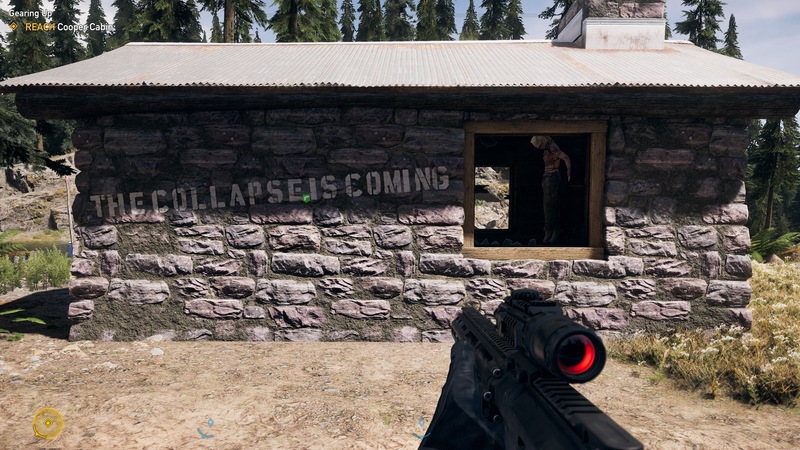 I could see myself hopping in and checking out new maps as more and more content creators start to get their hands on Far Cry 5; the potential is strong here. 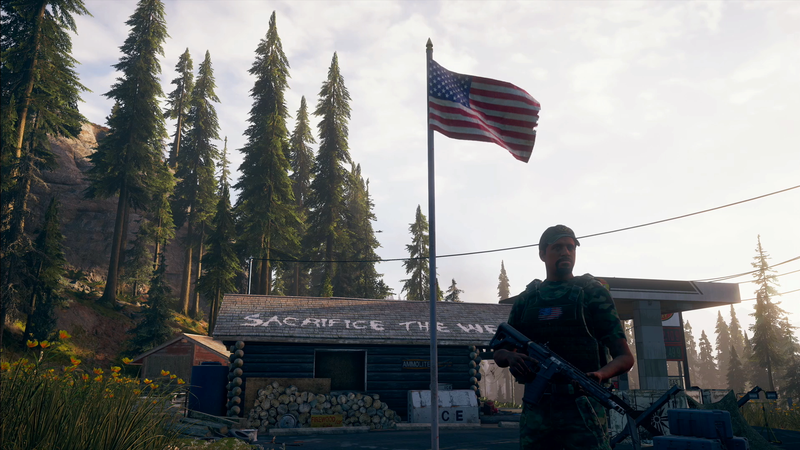 At times, Far Cry 5 carefully treads the line of being topical with its themes into the geopolitical landscape. Much more than simply fighting with angry cultists, the citizens of Hope County are looking to the Deputy to solve any and all problems in their daily life. Unfortunately, these problems are quite irregular and often range somewhere between tracking down lost keys all the way to tracking down a certain ‘pee tape’ that’s popped up in modern news. In all the midst of hallelujahs and hails of bullets, I wasn’t quite expecting the level of crude and raunchy humor that was going to tag along with some of the Guns for Hire. Far Cry 5 doesn’t strike me as a reformation of a series formula that has worked well for years, but rather a baptismal into something new. It can be hard for Ubisoft to wash away the sins of open-world game design, yet there’s the beginning of something greater to behold in Hope County. Whether making the trip to Hope County alone or with friends, the idyllic scenery makes such a stark contrast to the action of a Far Cry title that it’s going to be impossible to fly over and skip this one. On a technical note, our preliminary tests on PC indicate that performance is solid and gameplay is smooth; we’ll have a thorough benchmark analysis available later today. Below you can find a gameplay footage captured at 4K resolution on a PC powered by i7 6700K & GTX 1080Ti (without the Game Ready optimized drivers, which should become available in a few hours). Reviewed on PS4 Pro and tested on PC (codes provided by the publisher). You may purchase the game via Amazon. If you're wondering whether bringing the madness to our doorstep, making the entire campaign co-op and including an impressive toolbox to create new levels and missions while still retaining that visceral gunplay the series is known for keeps Far Cry 5 fresh and worth playing on Day One, my answer is: yes, absolutely.